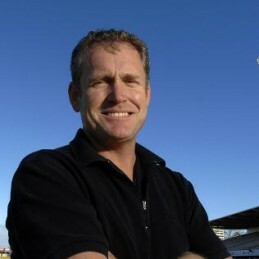 Tom Moody has been a significant contributor to Australian and Western Australian cricket for over four decades. His playing career began with WA in the 1985/86 season. He would go on to captain the state and enjoy success in his time as an overseas player with English County teams Warwickshire and Worcestershire. In total, Tom played 300 first-class matches. He scored 21,001 runs at an average of 46.25 and took 361 wickets at an average of 30.70. He played 366 one-day matches scoring 11,258 runs at an average of 38.82 and taking 257 wickets at an average of 30.02. He won five Sheffield Shield and four domestic one-day championships with Western Australia and was part of two world cup victories, both held at Lords in England. Tom’s international career began in 1987 as part of Australia’s inaugural World Cup win and finished shortly after the 1999 win. Tom was a dependable all-rounder who could significantly impact a game with both the bat and ball. His opportunities in Test cricket were limited but in only eight Test matches he scored two centuries with his first coming in just his second match. Following his retirement, Tom took a full-time position with Multiplex Construction, a company that he had been involved with during his playing career. He then took the role as the inaugural Director of Cricket at Worcestershire which culminated in the side beginning an era of success. In 2005 Tom embarked on a coaching career that began as head coach of the Sri Lankan team. He quickly transformed the team into a well-oiled professional outfit, leading them to the 2007 World Cup final and in the process becoming hot property as a coach. Tom returned to Western Australian cricket, serving three years as the head coach of the Western Warriors, before coaching IPL Sunrisers Hyderabad for the 2013 season. Tom has also found time for a successful media career. He has commentated all around the world as well as some Australian Test and one-day internationals for Channel Nine and Big Bash for Channel Ten.